are squeezed into one square kilometre and violence is the norm. one position to the other. militant dead and three injured. The army lost two men. least 70 people had been killed. Palestinian camp, this is not Israel." people, many of them civilians, under the watch of the Israeli army. restrictions and borders that are almost impossible to cross. borders of Israel. The name means the "Sweet Water Spring". for a fight to break the deadly boring cycle of the day. 70,000 Palestinian refugees are squeezed into a square kilometre. streets like gangs. Violence is the norm, and escape is impossible. intelligence just to get inside the camp. casings, a reminder of the heavy fighting. A few metres on from the Lebanese army, there is another checkpoint. trainers. They are veterans from the PLO's heyday of the 1970s. Now you are in "Palestinian territory". revolutionary brands: PFLP, DFLP, Fatah, Hamas and so on. father was born in a refugee camp in another country, and so was she. 1970s, such as the Leila Khaled hijacking of an El Al plane. sentenced him to death three times. dress for the Salafi-jihadi Islamists in the region. Iraq but also for wanted criminals such as arms dealers. hero, martyred in Iraq in 2005 fighting the crusaders." "Who wants to see him?" one asks me, still busy eating his ice cream. I explain that I already know Abu Omar. yard where Abu Omar is sitting, surrounded by his men. when he was a small boy after the 1948 war. movements mirrors the story of the Middle East. overweight, corrupt officers who didn't know how to fight." He says he participated in many attacks against the US and Iraqi army. back to Ramadi. He did two trips of six months each to Iraq. the Americans are there in Iraq. Both are occupations." my genuine Iraqi ID card.) He was given a Shia name. security vacuum that jihad flourishes. Just like in Iraq." with the Lebanese army the day before. like we are killing Fatah al-Islam [in Nahr Al-Bared camp]'," he says. scale battle raged for hours. "Abu Omar had taught us how to fight,"
the young fighter told me. jailed by the Israeli army a few weeks earlier. laid next to the jailed leader's picture like a bundle of flowers. blond on top. A small wooden map of Palestine hangs around his neck. it is a piece of Christ's cross. the PFLP; his father, uncle and mother were all communist. boring here. Even the people I meet I have met every day of my life. We have talked about everything." "Do you go out of the camp?" I ask him. "Why not? The sea is very beautiful near here." soldiers they look at you as if you are a piece of filth." Lebanon, the army seals off the camp. peeling potatoes. A hijab is tightly wrapped round her head. Middle East. It is tiny - three by two metres. at the cleric with his black turban and bushy beard. Islamists are against the Americans now, so I am an Islamist." their rhetoric has been exposed." becomes jihadis. Ain al-Hilweh, this is your perfect Failed State." criticisms of israel get you in this position. What hope does Ahmejinhadad have with his views? exploited by some Jewish institutions for their own gain. professor, who campaigned heavily to prevent tenure being granted. distortions" of the political scientist. opposition to my speaking out on the Israel-Palestine conflict." College of Liberal Arts and Sciences. than 800 full-time faculty members. is alive and well at DePaul." the process or the outcome of this case." that he hasn't had full professorship a long time ago." I read about this today. Muslims have become the target of prejudice in the way Jews were once persecuted, a minister declared yesterday. Shahid Malik, an international development minister, said he did not intend any comparison with the Nazi Holocaust. The complaint by the Dewsbury MP will carry added weight because Mr Malik is regarded as one of the most measured of Muslim leaders, regularly attacking Islamist extremism and suggesting that those who want to live under sharia law could emigrate to do it. The Burnley-born MP, interviewed for Channel 4's Dispatches programme by Mail writer Peter Oborne, told how his car has been firebombed in a petrol station and he receives regular hate mail. He said: 'I have been the victim of Islamophobia and hatred on many occasions. My family car from years ago was firebombed. Somebody did a hit-and-run while I was walking in a petrol station some years ago. Exaggerated stories about high-handed behaviour by Muslims are having a damaging effect and hampering the fight against extremism, added 40-year-old Mr Malik. He cited a newspaper account which said a hospital had been told to turn beds with Muslim patients towards Mecca five times a day and dying Muslims might be asked if they wished to face Mecca. TEL AVIV, Israel -- Safety pins and screws are still lodged in 15-year-old Ami Ortiz's body three months after he opened a booby-trapped gift basket sent to his family. The explosion severed two toes, damaged his hearing and harmed a promising basketball career. Police say they are still searching for the assailants. But to the Ortiz family the motive of the attackers is clear: The Ortizes are Jews who believe that Jesus was the Messiah. Israel's tiny community of Messianic Jews, a mixed group of 10,000 people who include the California-based Jews for Jesus, complains of threats, harassment and police indifference. The March 20 bombing was the worst incident so far. In October, a mysterious fire damaged a Jerusalem church used by Messianic Jews, and last month ultra-Orthodox Jews torched a stack of Christian holy books distributed by missionaries. The "Christian holy books" means Bibles I suspect. Maybe Messianic Jews are the "new Jews" too. If young British Muslims had any doubts that they are singled out for special treatment in the land of their birth, the punishments being meted out to those who took part in last year's London demonstrations against Israel's war on Gaza will have dispelled them. The protests near the Israeli ­embassy at the height of the onslaught were angry: bottles and stones were thrown, a ­Starbucks was trashed and the police employed unusually violent tactics, even by the standards of other recent confrontations, such as the G20 protests. But a year later, it turns out that it's the sentences that are truly exceptional. Of 119 people arrested, 78 have been charged, all but two of them young ­Muslims (most between the ages of 16 and 19), according to Manchester University's Joanna Gilmore, even though such figures in no way reflect the mix of those who took part. In the past few weeks, 15 have been convicted, mostly of violent disorder, and jailed for between eight months and two-and-a-half years – ­having switched to guilty pleas to avoid heavier terms. Another nine are up to be sentenced tomorrow. The severity of the charges and sentencing goes far beyond the official response to any other recent anti-war demonstration, or even the violent stop the City protests a decade ago. So do the arrests, many of them carried out months after the event in dawn raids by dozens of police officers, who smashed down doors and handcuffed family members as if they were suspected terrorists. Naturally, none of the more than 30 complaints about police ­violence were upheld, even where video ­evidence was available. Nothing quite like this has happened, in fact, since 2001, when young Asian Muslims rioted against extreme rightwing racist groups in Bradford and other northern English towns and were subjected to heavily disproportionate prison terms. In the Gaza protest cases, the judge has explicitly relied on the Bradford precedent and repeatedly stated that the sentences he is handing down are intended as a deterrent. Imagine if there had been 'terror raids' on Jewish homes near the Olympics site and those people had been fitted up. I think you know where I'm coming from. If you haven't read this already please do - links freemasonry, Theosophy & Nazis to help understand much better the forces behind todays Gestapo tactics in London. 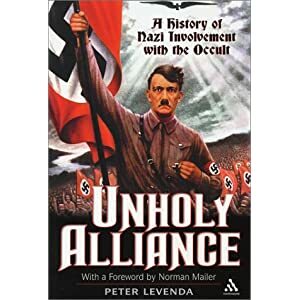 This comprehensive popular history of the occult background and roots of the Nazi movement shows how the ideas of a vast international network of late 19th- and early 20th century occult groups influenced Nazi ideology, from Madame Blavatsky and Aleister Crowley to the Thule Gesellschaft, the Order of the Golden Dawn, the Order of the Eastern Temple, and the pseudoscientific expeditions to Iceland and Tibet of the Ancestral Heritage Research and Teaching Society. Nazi appropriation of the occult was a weird farrago of astrology, Freemasonry, racism rooted in occultism and popular European folklore (the Cathars, the Holy Grail, the Knights Templar, the Arthurian legends). It also traces the Nazi movements as they continued their activities after the war (the Nazi ratlines to South America, the Colony of Righteousness in Chile) or "morphed" into neo-Nazi, skinhead and satanic groups such as the Christian Identity and White Aryan Resistance movements. The Tax Justice Network Roadshow comes to Bristol. British forces already for action in Syria? US Soldiers form anarchist Maryland Militia with $90k worth of assault rifles. Richard Cottrell on his new book 'Gladio, NATO's Dagger at the Heart of Europe, The Pentagon-Nazi-Mafia Terror Axis'. Journalism is dead as the mainstream press parrot the government line without criticism. Old Labour Oxford Economist Martin Summers returns after his August break. Anders Breivik, who carried out the single most deadly attack analysed by the survey – in all 77 people were killed and 242 injured. The threat from far-right terrorists is being neglected by governments and law enforcement, according to the most extensive survey yet of “lone actors” in Europe. While Islamist plotters are given full attention, the authors of the 98-page report warn that in comparison, individuals and small groups of rightwing extremists in the mould of Norway’s Anders Breivik are in fact more lethal, almost as numerous, and much harder to detect by security services. Britain leads any other European country for the sheer number of attacks or plots over the past 15 years that have been planned by individuals or self-starting cells, according to the analysis conducted jointly by four research institutes. It also finds that almost half of rightwing attacks in Britain over recent years were partly motivated by the murder of Lee Rigby – a wave of violence that ranges from arson attacks through to bombings of Islamic centres. Analysing 31 European countries, researchers found there had been 124 individuals involved in 98 attacks or plots over a 15-year period. After the UK’s 38 planned attacks, France came second with 11. Germany and Sweden both had five. The report’s authors concluded that while such attacks have been rare in Europe – 10 countries had no documented attacks in 15 years – there has been an increase in the frequency of attacks after 2011. High profile perpetrators in the UK include Lee Rigby’s killers: Michael Adebolajo and Michael Adebowale. Others include Pavlo Lapshyn, a white supremacist terrorist who stabbed a Muslim grandfather to death and bombed mosques in an effort to trigger a racial war. Lapshyn’s bombing campaign started after the murder of Rigby, with his final explosive detonating weeks later on the day of the soldier’s funeral – although police have said they do not believe he was motivated by the murder in London. The joint report by experts from Royal United Services Institute, Chatham House, the Institute for Strategic Dialogue and the University of Leiden in the Netherlands deemed such attacks “lone” even if they involved up to three people, as long as the individual or group was acting without either an order to act from outside or “direct support in the planning, preparation and execution of the attack”. Out of the 124 perpetrators in the database, 38% were religiously inspired and 33% were branded right-wing extremists. The authors of the report said they were surprised by the finding, given the focus on Islamic extremism. Melanie Smith, one of the co-authors of the report, said that the researchers were surprised at the high proportion of far-right, lone-actor terrorists recorded across Europe. This perception might also explain the allocation of resources by authorities. “When we looked into where resources were going, it became clear that actually the vast majority were going to looking for religiously inspired terrorists … which kind of made sense to us because that’s what we were expecting too, but that’s not the case,” she added. By European standards, she said the relatively high number of far-right attacks in the UK could be due to the ease of collecting data, but also due to inspiration by some organisations. Analysts also identified distinctive differences in the profile of far-right perpetrators and their religiously motivated counterparts, who include self-styled jihadis. Rightwing perpetrators – those who were motivated by an “emphasis on immigration policy, a wish to inspire patriotism and to defend their country from what they term ‘Islamisation’” – tended to be older: the majority of them were about 40 years old. They were also more likely to be socially isolated. Plotters and attackers from the religiously-inspired cohort were far younger – most often less than twenty-five years old – as well as being less socially isolated. They tended to have the lowest indication of mental health issues. From the 72 successfully launched attacks within the database, religiously inspired attacks caused only 8% of deaths. By contrast, rightwing terror attacks accounted for fewer executed attacks in total but just under half of deaths. “The most frequent targets were civilians, in particular ethnic and religious minorities, asylum seekers and immigrants. A large majority of religious targets were Muslim,” the report found. The single most deadly attack in the set was carried out by rightwing anti-Islamist fanatic Anders Breivik. On 22 July 2011, Breivik detonated explosive devices targeting government buildings in Oslo’s city centre, then made his way to a summer camp on the island of Utøya, where leftwing youth were having their annual retreat. Dressed as a policeman, Breivik then set about gunning down as many teenagers as possible. In all 77 people were killed and 242 injured. Yet despite the horror of that day researchers found that just over three-quarters of attacks failed to cause any fatalities, and 58% caused no injuries. “While lone-actor terrorist attacks can be devastating, a high proportion of plots fail to materialise in this manner,” the authors said. The challenge to the security services in Britain and elsewhere was also underlined by a lack of discerning or “typical” traits of lone-actor terrorists, who often evaded the “tripwires” of intelligence services and police monitoring of established terror networks. The one outstanding common feature was that 96% of the perpetrators were male. The challenges of identifying them were apparently deepened by the fact that two-thirds of lone actors had never been active within an extremist group. At the same time, the researchers stated that far-right groups such as Pegida, which has recently launched a British wing, might provide “moral oxygen” for some violent plotters. Adding that their research suggested a need for increased coordination among EU member states, in particular when it comes to far-right movements operating across national boundaries, the report highlighted that no far-right organisations were currently listed as terror groups. Information sharing between states must be improved to avoid the “internationalising” of certain movements who are able to move from one state where they are banned to another where they are not. “A concrete example of existing imbalance is the group Combat 18 and its associated Blood and Honour organisation, to which numerous lone actors across different countries in the dataset have exhibited a link,” it states, citing a movement which originated in the UK. In terms of how plotters were detected, it found that of the religiously-inspired perpetrators that exhibited “leakage” of their intentions, 45% “leaked” to friends or family, in contrast with only 18% of leakage by rightwing perpetrators. Rightwing lone-actor terrorists were more likely to post telling indicators online, where 41% of their leakage occurred. A key recommendation was aimed at social media companies such as Facebook and Twitter, who currently offer users the opportunity to report content posted by individuals or a page on their site. Last October this same Royal United Services Institute (RUSI) invited Andriy Parubiy, co-founder of the Social-National Party of Ukraine, to appear as a guest speaker in London. PARIS (Sputnik) - French President Emmanuel Macron said Thursday that the government would take all necessary measures to fight radical Islamism, of which include imposing control over the foreign financing of mosques. "I met the Saudi Crown Prince [Mohammed bin Salman], and we addressed this issue. I want it so that foreign financing [of mosques] is organized under the control of the state and is transparent. I don’t want any mosques to open with backdoor financing," Macron told TF1 broadcaster. The French president vowed to take all the necessary steps to fight Islamic fundamentalism. "We will take all the necessary measures to fight radical Islamism … Firstly, we gave ourselves the means to close the [salafist] mosques, and we will continue doing this. Secondly, we will pursue the deportation [policy]. Thirdly, we have to clarify the rules for [mosque] financing and operation," Macron said. On Tuesday, Macron held talks with Saudi Crown Prince Mohammed bin Salman during the latter’s visit to France. The two leaders discussed the ongoing crises in the Middle East and fight against terrorism. In October, Macron signed new counterterrorism legislation to replace the already two-year state of emergency that was initially introduced in the aftermath of the 2015 terror attacks in Paris. In February, French Interior Minister Gerard Collomb said that three mosques were closed in the French cities of Aix-en-Provence, Sartrouville and Marseille due to their "apologetic attitude toward terrorism."